Our Beautiful World. 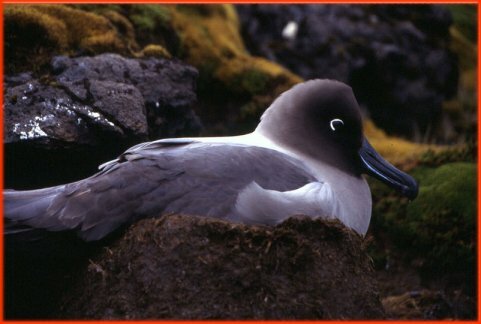 The Sooty Albatrosses, Light-mantled Albatross, Gråalbatross, Phoebetria palpebrata and Dark-mantled Albatross, Phoebetria fusca"
at sea across the Southern Ocean from South America to Australia. nasal passages that attach to the upper bill called naricorns. 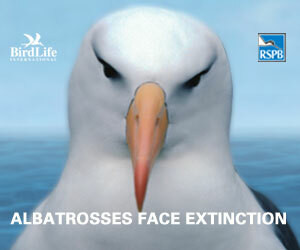 Although the nostrils on the Albatross are on the sides of the bill. above the nasal passage and helps desalinate their bodies, due to the high amount of ocean water that they imbibe. It excretes a high saline solution from their nose. Their diet consists of squid, crustaceans, cephalopods, fish, and carrion. to 60 pair. 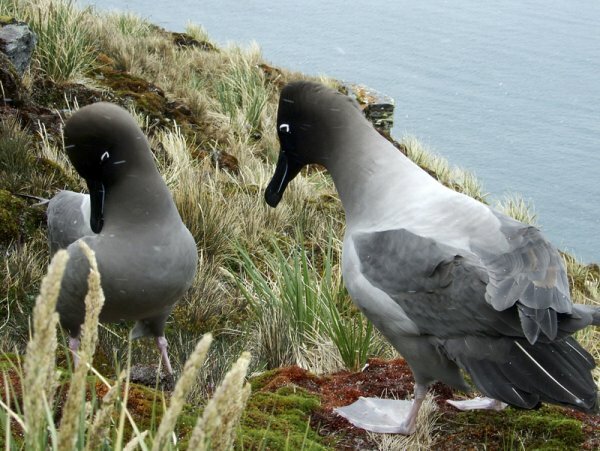 They will build their nests on cliffs and steep slopes. Whereas they can mate annually they only do so biennially. oceans north to about 30°S. hreats and population status both remain poorly known. Phoebetria palpebrata has a circumpolar distribution in the Southern Ocean. north into temperate and sub-tropical seas in winter. Crozet and Kerguelen islands, Heard Is., Macquarie Is. and Prince Edward and Marion islands. The total annual breeding population is estimated at 19,000-24,000 pairs, equivalent to 58,000 mature individuals in this biennially breeding species1,4. Population trends are poorly known. introduced predators at some sites. 2010. Phoebetria palpebrata. In: IUCN 2010. IUCN Red List of Threatened Species. Version 2010.3. <www.iucnredlist.org>. Downloaded on 08 September 2010. The species breeds in loose colonies or small groups, and sometimes is a solitary breeder. at the base, with a cupped hollow at the top. It incorporates some plant material and with a grass lining. Around October or November,[ a single egg is laid, which is not replaced if lost. Both sexes incubate alternately in shifts that vary from a day or two up to nearly a month in length. while the adults forage, returning to feed the chicks by regurgitation every 23 days. after which they breed biennially, fledging a chick every five years or so. They are capable of breeding until at least 32 years old and living to 40 or longer. 2010. Phoebetria palpebrata. In: IUCN 2010. IUCN Red List of Threatened Species. Version 2010.3. <www.iucnredlist.org>.